as a snack throughout the day. 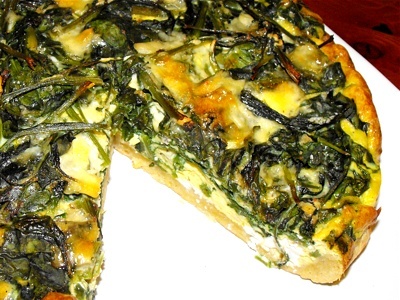 Cold quiches are great for picnics or lunch boxes too. These leafs are green so you know you are eating something healthy. Their high nutritional value, contains plenty of vitamins and antioxidants. Popeye the sailor man favoured spinach as his strength booster and in a way these green leaves really have a reputation of being a superfood. Choose one of our tested and liked bases. until the leaves are sunken together. Cut the feta cheese into cubes. Fill the cream in a separate bowl. Crack the eggs in, season and add the Gruyere cheese. Sprinkle the feta cheese onto the base. Then spread the steamed spinach on top. Optionally top the spinach with tomato slices. thick layer of spinach. As you can see in the photo it worked quite well. The last step is pouring the cream, egg, cheese mix as evenly as possible. 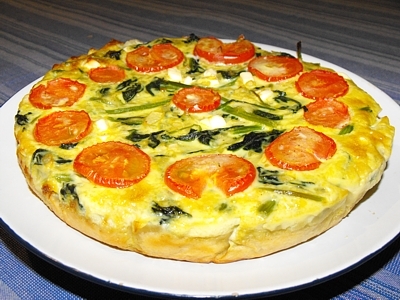 Place the quiche into the to 200C° preheated oven for 40 to 45 minutes. Convert! Serve as a snack, starter or accompanied with a soup and/or salad as a main. Remember to drop us a note how you liked it and how you got on with the quiche recipe.